Farmersgirl Kitchen: Look what I won! I was delighted to hear that I had won a prize on Karen's blog, Lavender and Lovage. 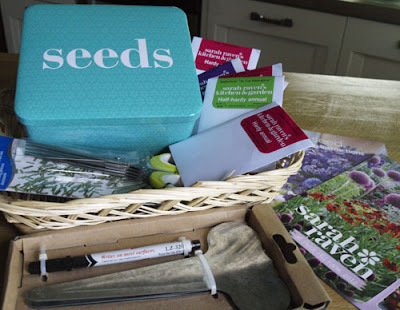 The prize came from Sarah Raven, there was the 'Seeds' tin, some packets of All Year Edible Flower seeds, the plant labels you can see at the front and a pair of herb scissors with multiple blades. There was also a sowing and planting guide to help make sure the seeds are successful. You are going to have to wait until next summer to see my seeds sown and hopefully some pretty flowers. Many thanks to Karen for hosting the giveaway and to Sarah for the prize. I have a really nice giveaway coming up this week. Congratulations Janice, what a lovely win. Those great big plant labels look fantastic. Ooh nice! That looks like a lovely gift to win.